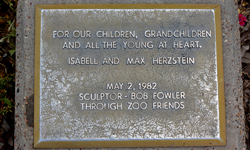 The life-sized representation of an African elephant has been a landmark at the Houston Zoo since it was donated by Isabell and Max Herzstein in 1982. 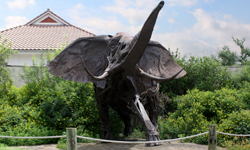 Originally placed at the Zoo’s main entrance, it was relocated in 2000 when the second entrance was opened on Cambridge Street. It received restoration work at that time. 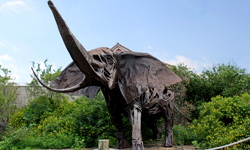 Although the five-ton sculpture is made of Cor-ten steel, it appears to be in motion. 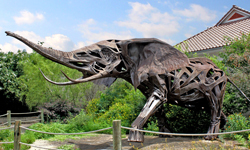 It was created of steel rods welded together by Robert Fowler, whose work is represented elsewhere in the Zoo, as well as around the world. He began his sculpting career in 1963 and received many awards throughout his life. Other Fowler works in Houston include Two Horses at Jones Hall, a sculpture in front of Colombe D’Or, and the centerpiece sculpture in the atrium of the University Center at the University of Houston. He died in 2010.